In a gallon zip bag add flour and seasonings. Seal and shake. Heat a heavy skillet and add oil. 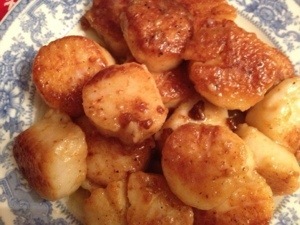 Add sea scallops to bag and shake to coat. Remove from bag and shake off excess. Add to pan in a single layer. Sauté for about three minutes and turn over. If they are sticking to the pan cook another minute. Flip. Cook about a minute then add butter. When butter is melted add wine. Stir lightly for a minute until wine sauce is bubbly. Dress greens with oil and vinegar, herb seasoning and salt and pepper. 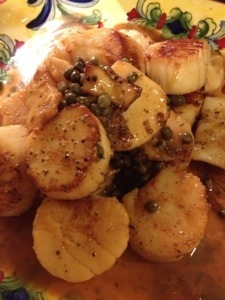 Pile greens on plate and top with scallops and sauce. Slice zucchini in 1/4 slices longwise. Brush olive oil on both sides and grill until beginning to brown. Slice bread in half length wise. Toast under broiler until slightly brown. Remove immediately, brush with olive oil then rub with peeled garlic clove. Season with Italian seasoning. Put basil then zucchini on bottom half of bread. Cover with half the tomato and mozzarella slices. Layer top half of bread with remaining tomato and mozzarella. Put under broiler until the cheese starts to bubble but not burn. Remove from oven, sprinkle with more Italian seasoning and layer one half with crispy lettuce. With a hand on each half, close the sandwich quickly and press down on a flat surface to marry both sides. Slice and serve. Feeds two hungry college boys or 3-4 adults. Mix yogurt, chives and salt in a bowl and set aside. Core and dice apple. Add about 2 tablespoons to yogurt mixture and stir. Dice onion and add apple and onion to a medium mixing bowl. Drain and rinse black beans. Add to bowl. Add vinegar and toss gently. Heat large heavy skillet over medium heat. Brush Extra Virgin Olive Oil onto pan. Put tortilla in skillet and flip every 0 seconds until it begins to brown and bubble. Sprinkle a thin layer of cheese over entire tortilla. With a slotted spoon put a thin layer of the apple mixture onto half of the tortilla. Fold over and let cook about 30 seconds. Turn onto a cutting board and let cool a few minutes. Cut into thirds. This evening, October 9, 2012 I will be cooking and talking about “Healthy Options” at Independent Health’s Healthy Options Cooking Class at D’Avolio Kitchen. 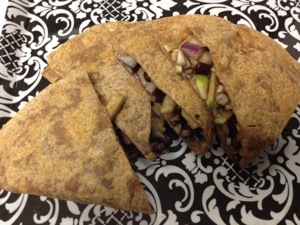 Quesadillas Wheat tortillas filled with apples and red onions flavored with D’Avolio Black Current Balsamic Vinegar, black beans and Fontina cheese. These are served with a seasoned Greek yogurt dipping sauce. Roasted Chicken Snack Strips Boneless, skinless chicken breasts rubbed with D’Avolio Milanese Gremolata Extra Virgin Olive Oil and seasoned with Basik’s Hunter Blend seasoning available at D’Avolio. 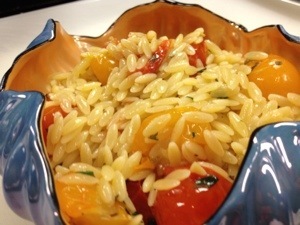 Orzo Tiny rice shaped pasta with roasted grape tomatoes and garlic seasoned with Olio Fresca Herb Mix, available at D’Avolio’s and D’Avolio Arbequina Extra Virgin Olive Oil. Peaches Ordinary canned peaches made extraordinary with seasoned mascarpone cheese and a drizzle of D’Avolio 18 Year Traditional Balsamic Vinegar. For an extra kick we sprinkle just a pinch of Vanilla Bean salt. The recipes will be posted tomorrow and can be found in the IHA tab on the right.